This the Turtle Arena news archive, for the latest news go to the home page and/or the development blog. Turtle Arena 0.5.3 is now available for download. See the blog post for details. Turtle Arena 0.5.2 is now available for download. See the blog post for details. Turtle Arena 0.4.3 is now available for download. Fixes remote code execution on Linux client. See the blog post for details. Turtle Arena 0.5.1 is now available for download. Turtle Arena is on its way to being... well, extraordinary. See the blog post for changes. After many months of development Turtle Arena 0.5.0 is now available for your enjoyment! There have been many improvements and new features. There is now four player splitscreen and many higher resolution graphics, among other things! Started a development blog for posting things that are not big news. Big news, such as new releases, will be posted here as usual. Updated Turtle Arena 0.4.2 Client and Server for Windows, now support Windows 2000 (and possibly older Windows) like previous releases. Turtle Arena 0.4.2 bugfix release is now available. Fixed crash at startup issue in base (non-OpenAL) sound code. Turtle Arena now has a master server, which is set by default in the new release, sponsored by MasterSplinter. Happy new year and a new Turtle Arena release! Turtle Arena 0.4.1 has been released, you can get it on the download page. Turtle Arena 0.4.1 is a bugfix release for the unpublicized buggy Turtle Arena 0.4 release. Turtle Arena 0.4 fixed many bugs from 0.2, improved and added new features. Some features have not been finished, but will in later 0.4.x releases. One notable improvement is the Turtle players now look better and have more animations. The website has not been fully updated, new screenshots and videos will be added relatively soon. Got something to say? There is now a forum for discussing Turtle Arena. Now go sign up! Added a Windows Installer for Turtle Arena 0.2 to the download page! The Turtle Arena website has moved to http://ztm.x10host.com/ta/, http://ztm.x10host.com/ is now ZTurtleMan's website. Update: The Turtle Arena RSS feed has moved, update its location to http://ztm.x10host.com/ta/feed.rss. http://ztm.x10host.com/feed.rss will still be a valid feed, but for my website not Turtle Arena. Turtle Arena 0.2, now with 300% more turtle, is now avalible for download! Get it at the download page. Renamed TMNT Arena to Turtle Arena to hopefully avoid tradmark issues with the game. 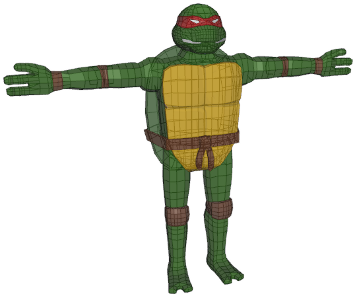 TMNT Arena is currently undergoing active development. TMNT Arena alpha now available! Started TMNT Arena project at Google Code. Turtle Arena 0.2, now with 300% more turtle, is now avalible for download! Turtle Arena 0.2 will (hopefully) be released by the end of the month. TMNT Arena has improved much since the alpha, still some work to do before the beta. Project is now somewhat on hold due to college. TMNT Arena alpha version is now available. Its still a work-in-progress, unfinished, buggy, and isn't _fun_ yet. Feedback and assistance are welcome. Started a guide for running the game, see [RunningTheGame]. The source and data are in the svn, soon I'll upload a alpha (just need to do some quick testing and fixing~).